New Exhibits Opened at Graceland - Misc. Three new exhibits are now open at Graceland for guests to tour. Graceland Crossing is home to the new Private Presley Exhibit and the '68 Special Exhibit and Shop. In addition, the Graceland VIP Tour now includes an all new exhibit. In honor of the 50th anniversary of Elvis's induction into the Army, the special exhibit Private Presley celebrates Elvis's service to his country. The exhibit will walk you through Elvis's Army induction and his time spent in the Army from 1958-1960. 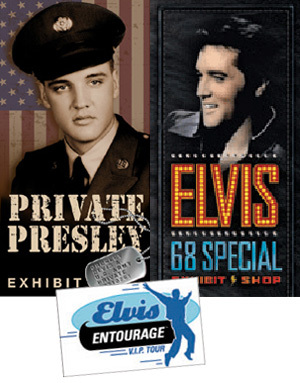 Special artifacts include Elvis's Army fatigues, dress uniforms, army foot locker, suitcases and more. Click here to read about what Priscilla had to say about the new exhibit. This year celebrates the 40th anniversary of Elvis's landmark television event, the '68 Special. This free exhibit offers a look at this historic event through videos, photos and displays of artifacts from the special. The displays include some of the outfits Elvis wore during the '68 Special, a script and a timeline of significant historic events occuring in the U.S. at that time. In addition to all the other great benefits, visitors who take the VIP Tour are granted access to an exhibit of artifacts that relate to the personal side of Elvis. It includes the deed to Graceland, a gift from Elvis to his parents, and fun items from Elvis's personal wardrobe. And for the first time ever, VIPs will also see the living room furniture from Elvis and Priscilla's honeymoon hideaway in Palm Springs. The working barn behind Graceland was one of Elvis's favorite places to unwind. If you choose the VIP option, you'll be able to explore that side of Elvis with items from that space including his personal saddle, chaps and other artifacts relating to the Presley's equestrian activities.